When The Houso burst onto the scene late last year, he shocked everyone with his class. The little chestnut who could pulled off three wins from three starts and gained himself a cult following in the process. The Houso flashes a smile after his debut win at Moruya. Credit: Bradley Photos. After eight months off the now six-year-old is set to resume in the Swiftwood Tiles & Bathrooms BM 66 Handicap over 1000m at Goulburn on Friday. Parker has taken his time with the injury-prone gelding and expects him to run like he’s fleeing a crime scene. Apprentice jockey Robbie Dolan will provide 2kg of weight relief and The Houso has drawn ideally in barrier 5. The Houso hasn’t had an easy life. He was bought off an internet auction site by Campbelltown Police Officer Rod Sheraton for just $1500. When he arrived in Sydney he was skinny, shaggy and had crooked feet leaving Rod wondering if the horse would even make the track. 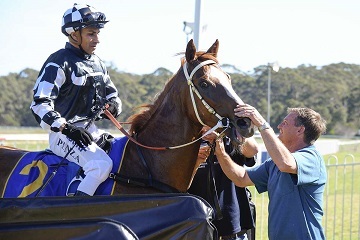 But with a little love and care and time to overcome a tendon injury, The Houso excelled and is so far unbeaten. “When you win three in a row there is a lot of pressure to keep the winning streak going,” Parker said. View the fields and form (including race replays) for Friday's Goulburn meeting here.